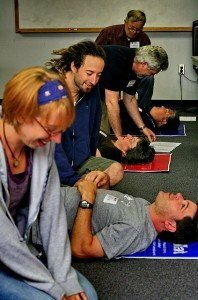 Re-certify your WAFA/WFR with the Wilderness Medicine Institute of NOLS. Built on the national pre-hospital care standards of the Wilderness Medical Society and Department of Transportation First Responder courses. WMI offers this course with a two-year re-certification for Wilderness First Responder (WFR) and Wilderness advanced first aid (WAFA) and Wilderness EMT. Includes two year CPR. This course may be used to recertify current Wilderness First Responder and Wilderness EMT (wilderness portion only) and Wilderness Advanced First Aid certifications: WMI, NOLS, SOLO, OPEPA, WMA and WPT. There will be a written examination at the beginning of this course. If you have a certification from another company or are expired please contact WMI directly at (866) 831-9001 to discuss your options. Meets requirements for Utah River Guide Type I and II licensing (and more than meets requirements for Type III and IV licensing.) Please check with your employer regarding level of certification needed and for company requirements. Backcountry emergencies are markedly different from those occurring in urban settings. The possibility of prolonged evacuation dictates that training conveys the knowledge and skills required for medical stabilization and rescue. Wilderness professionals, guides, rescue team leaders and members are ethically and legally held to high standards of competence and performance. Their work often presents difficult problems in medical and rescue procedure, and related questions of liability. Wilderness Medicine Institute of NOLS offers integrated curriculum covering all three of these important aspects of wilderness care. For more information on recertification from other programs or for the full schedule of WMI courses, call (866) 831-9001 or WMI/NOLS. For camping, hostel, motel options, pet care, and other travel information visit the Travel Council website.